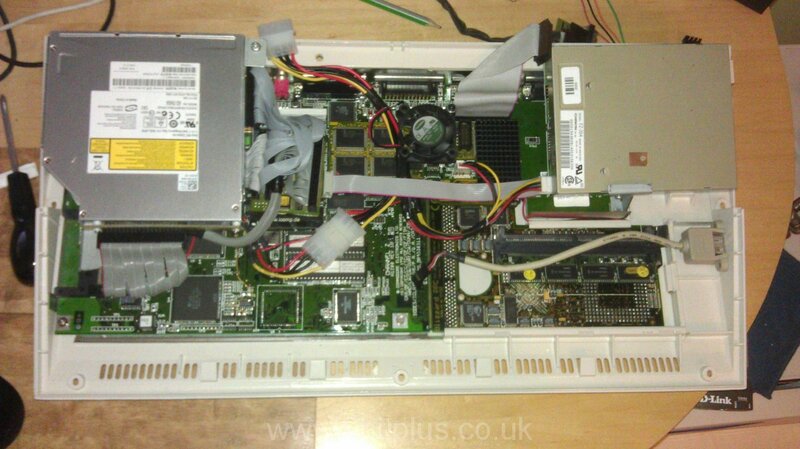 One of the very few things I’ve had time for this year is playing around on my fantastic modified Amiga 1200. A couple of years ago I installed a Blizzard PPC, Subway and an internal DVD drive to the little computer and its all been working very well. Recently I got the opportunity to add a little extra to the system, a graphics card. The Phase 5 Blizzard Vision (BVision) to be precise. So I decided to see how far I could push this little computer and take it too the max. 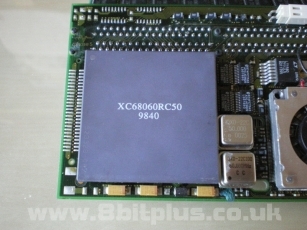 I was incredibly lucky to get hold of a 68060 version of the Blizzard PPC card. 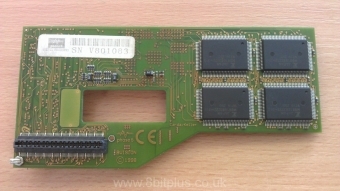 This is the most sort after card for the Amiga 1200. The 060 is far more powerful than the 040 I was previously using. It uses less power and runs cooler too. No need for a heat sink on the CPU, just allow for good airflow from my fan under the case. The PPC is also clocked higher on this card, 210Mhz. Not the fastest version ( 240mhz) but a good boost from 160mhz. 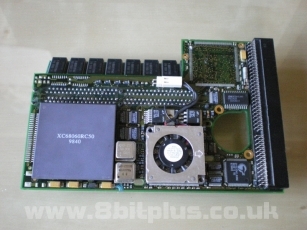 Its a Permedia 2 GPU and 8mb of RAM, its capable of displaying a screen resolution of 1600×1200. 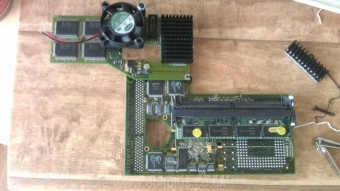 Not bat at all for an Amiga but the only problem is that the GPU makes so much heat that Phase 5 only recommended its use in a tower to allow enough air flow around the chips. Clearly some modding is required to get this working well in the desktop case. The solution is to install heat sinks and fans. The card has no provision for attaching coolers so I got a couple of sheets of double sided, self adhesive thermal pads. They cut to size and hold the heat sink on very well. They should be safe to remove in the future unlike proxy compounds. 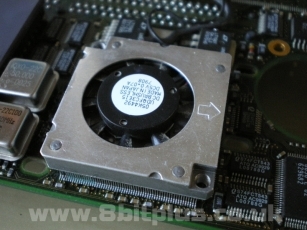 Only the Permedia chip needs a fan, as it makes the vast majority of the heat. 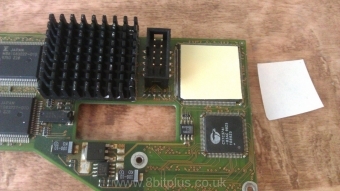 The controller chips on the right also get very warm, so it got a heat sink too. the RAM doesn’t seem to get too hot so for the time being is left alone, but the case fan positioned above will help keep a bit more air moving. With the inclusion of this extra card I needed to rethink the internal layout, particularly the location of the DVD drive. In the old setup I positioned it almost right in the middle of the case. 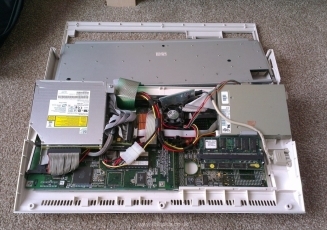 With the gfx card extending away from the floppy drive I needed to move the DVD over to the far left. I also took the opportunity to change the drive to a more stylish Slot Load type. The result is very good I think. I also included a photo showing just how complicated the system is becoming. This was a very ambitious project, and one I never finished. 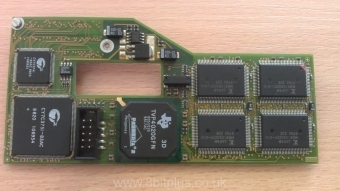 the Amiga 1200 was never meant to upgraded to this level. 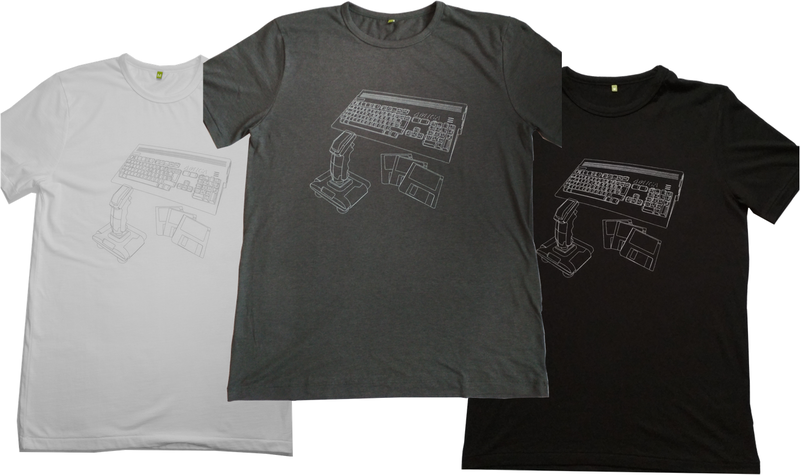 the designers at Commodore would have been surprised that upgrades were produced for as long as they were (well into the PPC era) and that the community would want to keep the machines going for so long. I did run into stability problems during testing. Both software and hardware, but not related to overheating. Dual booting allowed me to switch between OS3.9 and OS4.0, both could make use of the GFX card but most of the 3D engines ran better on 3.9, as did the games. This project remained unfinished until early 2013 when I sold it all to another Amiga enthusiast on Amibay.